Pet owners know that dogs can sleep almost anywhere. It’s an impressive ability and one that any human insomniac will envy. As long as you’re not asking why your dog is sleeping more than usual and fretting about a possible health problem, then watching a canine snooze is one of life’s simplest pleasures. After all, it usually means that your dog has a full tummy, has been exercised and played with, and is feeling safe and content. In other words, it means that you’re doing a great job. One of the things that is a little peculiar, however, is a dog’s insistence on laying their head on your feet. Why do dogs sleep by their owner’s feet? That’s one body part that most humans are keen to avoid, and Fido has enough cushions and blankets dotted around the house to make a princess blush. Why would they choose this spot to catch forty winks? The answers to this question, while all are remaining in the field of theory, are many and varied – and they are almost entirely complimentary. Dogs sleep by an owner’s feet as a mark of affection and a desire to protect, which is a role most canines take very seriously indeed. Let’s take a deeper dive into the practice of why dogs sleep at their owner’s feet. 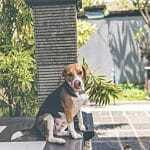 We’ll also how you can coach your pet out of his practice if it’s something that you find undesirable, though we can’t for the life of us understand why this would be the case. 1 Why Are Dogs So Keen on Their Owner’s Feet? 1.6 How Can I Stop My Dog from Sleeping at My Feet? 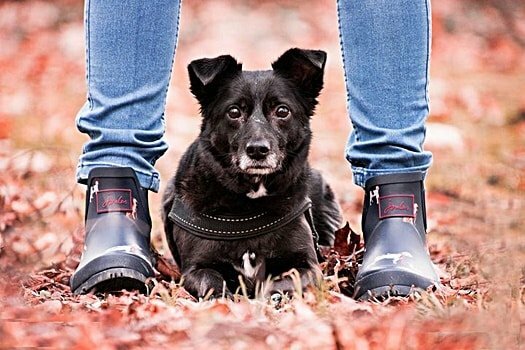 Why Are Dogs So Keen on Their Owner’s Feet? It often amuses and perturbs humans that are new to pet parenting just how much dogs appear keen on their feet. If you’re worried that your hygiene isn’t as strong as you thought and your dog is picking up on a distinct smell, don’t worry. Although your canine’s super-sensitive nose can detect a variety of unique scents and aromas from your feet, they’re like perfume to Fido. The reason for this is simple – dogs are shorter than humans. If you ever want to see the world through your pet’s eyes, get down on your hands and knees for a while and crawl around; it’ll give you a whole new perspective. This will help you understand that dogs are much closer to your feet than your face, and thus the smells they consider to be most desirable are those of your socks and shoes, not the expensive bottle of perfume you received. This is why dogs are so keen to run away with your socks and slippers when playing and to chew on your shoes when they’re teething; it’s all welcome, comforting and familiar scent for a canine. You don’t need to stop washing your feet for the sake of your dog – they’ll pick up the natural scents anyway. You will, however, need to accept that your dog will always consider your lower extremities to be your most enticing feature. Of course, general day-to-day activity is one thing – how about bedtime though? Why are dogs so keen to sleep in the awkward and uncomfortable position of their owner’s bony feet? There are many possible reasons. If you have ever seen a pack of puppies sleeping together, your heart will no doubt be melted by the manner in which they pile on top of one another. Adult dogs never quite outgrow this, and they don’t have any real desire to sleep alone. However, they also don’t relish the idea of being crushed in the night if you roll over. Setting up their bed for the night at your feet affords Fido the best of both worlds. When a dog makes themselves at home at your feet and settles down for the night, it’s because they see you as part of their pack and they want to stay close to you throughout the night. Your dog sees you in much the same way as a young child sees their parent, so it’s hardly surprising that that want to sleep in your bed with you. If nothing else, they’ll be keen to steal your body heat to stay toasty. There are pros and cons to sleeping with your dog, but if your pet is attempting to do so, it’s very much a compliment. It means that they trust you implicitly, and they are prepared to spend their most vulnerable times with you. Another reason that a dog may sleep at your feet is that they want to know if you are going to get up and move away during their doze. This is entirely understandable because as we have just explained, a sleeping dog feels like a vulnerable dog. Other than when they are relieving themselves, when a dog takes himself or herself off to bed they feel entirely exposed. When they sleep alongside you, they do so with the expectation that you will protect them if that becomes necessary. Wild predators tend not to roam suburban bedrooms at night, but a dog isn’t to know that – Fido will always adopt a, “better safe than sorry” approach. This means that he’ll sleep contentedly at your feet, but if you move those toes and make a move to get out of bed, your dog will want to know about it. They don’t understand that you just had one cup of coffee too many and need the bathroom at an antisocial hour. They know that you’re leaving your post, and will be watching to make sure you return – keeping an eye on you while you traverse that treacherous and dangerous hallway to ensure that you stay safe. 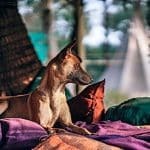 Nine times out of ten, your pooch will happily return to their sleeping position at your feet and pick up where they left off the moment you return. They just want to know immediately if you are going to do so, so they are not caught off-guard. Thankfully, this expectation of protection goes both ways. A canine that is snoozing and snoring away may not look like the most intimidating of guard dogs at a glance, but appearances can be deceptive. Many dogs are light sleepers and will leap into action to protect their owner if they deem this to be necessary. Regarding sleeping at your feet, a dog will do so that they can tell if an unwelcome stranger or any other threat (like the cat!) is getting to close to you. Oversee your dog when they climb onto the bed tonight, and see if they look to face the door. 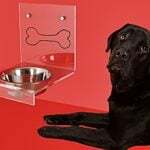 We’re willing to wager that they will, as this will enable your dog to see comings and goings and react before anybody or anything can reach you. Those few seconds can make all the difference when you have the rapier-sharp reflexes of a dog that is determined to protect their owner! 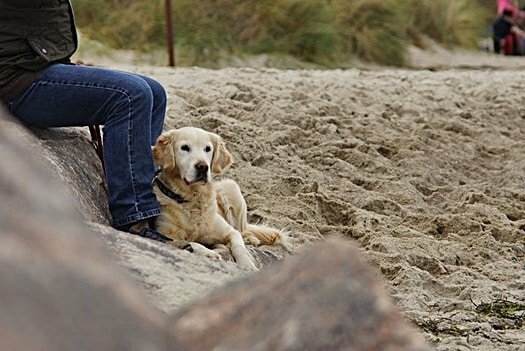 Sometimes, a dog will stick to your feet like glue because they are afraid of being separated from you – even for a moment. This is known as separation anxiety, or sometimes velcro bonding. The logic is simple. Even the most nervous dog understands that you won’t be going anywhere without using your feet to get there, so if they stick around they’ll be able to leap into action straight away and join you in whatever adventure you’re undertaking. While this can be cute and endearing at first, it can lead to serious problems further down the line. If your dog is exhibiting other signs of nervous behavior, such as whining when you leave the room, check out our guide on how to break separation anxiety quickly. Shy and fearful dogs rarely enjoy a genuinely fulfilling quality of life, and Fido could be missing out on all kinds of great experiences. If your dog doesn’t doze at your feet but still insists in hanging around, there could be a handful of explanations. You’re dropping food. So, you’re enjoying a snack in your favorite chair … and you’re dropping all kinds of yummy crumbs around you. Your hairy hoover will soon take care of those. They’re claiming you as their own. If you have more than one animal in the house, or you have to interact with other dogs or cats, you’ll have their scent on you. By sitting at your feet, your dog is claiming you as theirs. Just be thankful that they’re not marking you by peeing. They’re still in leash training. 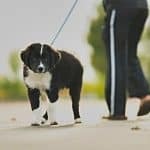 If you are training your dog to walk to heal, they may stay there all day. After all, they get a treat when they stay by your feet outside – if they’re lucky, they might get another one now. It’s a hug. Dogs hug by leaning their body against us. The experience of hugging makes many dogs feel trapped and restricted, so this is how they show their love. By sitting at your feet, Fido is offering the canine equivalent of a snuggle on the sofa. As you’ll see, dogs have all kinds of reasons why they want to be at your feet, and it’s nothing that you need to worry about. However, if you’re adamant that you do not want your pooch to continue this practice, you can train them out of it. How Can I Stop My Dog from Sleeping at My Feet? If you’re adamant that having your dog sleep at your feet isn’t working for you, you’ll have to adopt an approach of positive reinforcement for other parts of the house. Every time your dog willingly trots off to its bed or crate, reward them and make a fuss of them. If they try to sneak into your bed and lay at your feet in the night like a slobbery ninja, you should calmly get up and walk away – not saying a word. Sure, it will inconvenience you in the short term, but it’s the only way that your dog will lose interest. If neither of you is getting anything out of the experience, why bother? You’re going to have to be calm and patient with this training though, as you’ll be asking your dog to ignore a great many of their primitive instincts to protect and defend themselves – as well as their natural desire to be close to you. Consistency is crucial; your dog is either permitted to sleep and your feet, or they’re not. You can’t mix and match the rule from one day to the next based on your mood. Most owners would agree that having a dog sleeping at your feet is a pleasure. Sure, it may occasionally lead to a lost couple of hours’ sleep as Fido fidgets and keeps you up at night, but on the plus side, his body will be hugely toasty and warm. Plus there is the fact that he is keeping guard over you, preventing a surprise attack from anything untoward in the dark. If you are not concerned by the behavior of your dog sleeping at your feet, then leave them to it. If they show no other outward signs of emotional distress of concern, they’re just giving you some attention and affection. Who doesn’t love that from their canine companion?